Home / North Palm Beach Edition / Is PRP the Answer to Your Hair Loss? Is PRP the Answer to Your Hair Loss? Over the past few years, interest in PRP, or platelet-rich plasma therapy for hair regrowth has exploded as more physicians and patients become familiar with the cutting-edge treatment, which has proven itself as a viable way to stimulate scalp follicles to improve, enhance and regrow hair. In addition to its considerable potential for new growth stimulation, PRP is also proving to be a valuable tool in terms of helping to accelerate wound healing after hair transplantation. PRP is a natural, side-effect free regenerative treatment which has been widely used in many areas of medicine, including nerve damage, cardiac muscle injury, bone and ligament repair/regeneration, sports medicine, oral surgery and plastic surgery. While the medical community has been studying the applicability of platelet-rich plasma therapy for decades, only recently have hair restoration physicians really begun to look into its potential for hair loss patients. What initially began as a way to repair damaged nerves, tissues and bones is now seen as a way to stimulate this same type of cellular growth cosmetically, and in the case of androgenetic alopecia, as a way to restart weakened or dying hair follicles and produce new natural growth. So what exactly is PRP and is it the answer to your hair loss? PRP is a treatment derived from your own blood platelets to enhance hair growth as a stand-alone treatment or to improve the recovery and results of hair transplant surgery. Following a simple blood-draw, the patient’s blood is spun in a special centrifuge with specific kits designed to separate and concentrate the high-quality PRP – a powerful growth factor “cocktail.” Once activated, platelets release powerful molecules, which have profound biologic effects on the hair follicles and skin. Under comfortable local anesthesia, this powerful cocktail of growth factors, cytokines and other proteins is injected into the area of the scalp where weak hair follicles exist. In some cases Extracellular Matrix or ECM may be added to the PRP. Even more advanced procedures can enrich the PRP such as using the patient’s own adipose (fat) derived stem cells or signaling cells. The comfortable, outpatient procedure takes less than one hour to perform and patients may resume all activities, including workouts, shampooing, etc. immediately afterwards as there is no recovery phase. Mild soreness is rare and redness of the scalp, if any, resolves in less than a day and improved hair growth can be measured in a matter of weeks. PRP has been found to be most effective on two types of hair loss patients: patients who have thinning areas where weak quality hair exists on the scalp primarily due to male or female pattern hair loss and patients with small round bare patches of Alopecia Areata. People with certain blood disorders or on certain medications may NOT be good candidates for PRP. The first step is to schedule a consultation with a qualified, experienced and properly credentialed hair restoration physician who will be able to diagnose your situation, identify hair loss risk factors and discuss the best treatment plan to address your specific hair restoration goals. As with all hair loss treatments, PRP is most effective when started early, before the hair follicles have been completely obliterated or miniaturized beyond repair. The areas of the scalp where the hair follicles are producing hair fibers that are thin, wispy and weak is where PRP holds the greatest potential, and where the therapy can really make a difference. One downside to PRP treatment for hair regrowth is that it does not offer permanent results. Most patients who undergo PRP therapy using ECM require a repeat treatment in about 12 to 24 months. Without extracellular matrix, expect treatments as soon as every other month. It typically takes three months to measure the improvements from PRP using the scientific HairCheck cross-sectional hair bundle trichometry measurement tool. Over time, the PRP treatment may need to be repeated depending on the patient’s response to therapy, hair loss condition and goals. Are There Risks to PRP Therapy? Since PRP is derived from your body’s own blood, this procedure possesses little to no risk of adverse reactions. After your procedure, your scalp will feel numb and appear pink for a few hours. Temporary swelling in the forehead or eye area is rare and takes a day or two to resolve. The main risks of PRP have less to do with side effects and more with what the doctor and/or staff may be doing and using in terms of outdated techniques or equipment resulting in a painful or an ineffective procedure. 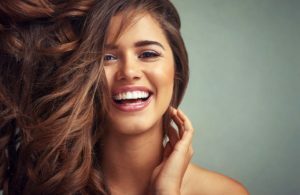 To reduce your risk of complications, seek out a physician with extensive experience specifically with PRP for the scalp, because techniques for hair growth are different when compared to other areas of the body. Patients should note that to achieve optimal results, a multi-therapy approach might be required, depending on the severity of the hair loss and their personal goals. PRP may be used as an adjunct to FDA-approved medications like finasteride and minoxidil, or other therapies like low-level laser therapy, compounded minoxidil, nutritional supplementation and minimally invasive FUE hair transplantation, such as SmartGraft, NeoGraft or ARTAS robotic-assisted transplants. by visiting www.baumanmedical.com or by calling toll-free 844-GET-HAIR or 1-561-394-0024. When it comes to finding out why you are losing hair and what can be done to effectively enhance, protect and restore hair growth, seek advice from an ABHRS-certified and IAHRS-accepted hair restoration physician who’s practice is limited to the diagnosis, tracking and treatment of hair loss at the earliest possible time.